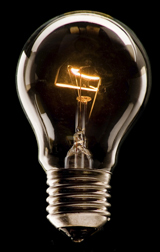 robby mcalpine blogs here: How many Christians does it take to change a light bulb? Pentecostals/Charismatics: Ten. One to change the bulb, and nine to pray against the spirit of darkness. Presbyterian: None. Lights will go on and off at predestined times. Episcopalian: Eight. One to call the electritian, and seven to say how much they like the old one better. Baptist: At least fifteen. One to change the bulb, and three comittees to approve the change and decide who brings the potato salad. Mormon: Five. One man to change the bulb, and four wives to tell him how to do it. Unitarian: We choose not to make a statement either in favour of or against the need of a light bulb. However, if in your journey, you have found that light bulbs work for you, that is fine. You are invited to write a poem or compose a modern dance about your personal relationship with your light bulb, and present it next month at our annual light bulb service in which we will explore the number of light bulb traditions, including incandescent, fluorescent, three-way, long-life, and tinted, all of which are equally valid paths to luminescence. Methodist: Undetermined. Whether your light is bright, dull, or completely out, you are loved - you can be a light bulb, turnip bulb, or tulip bulb. Church lighting service is planned for next Sunday. Bring bulb of your choice and a covered dish. Nazerene: Six. One woman to replace the bulb while five men review the church lighting policy. Greek Orthodox: Change? What is this 'change' you speak of?